Suggested style guidelines for your code. Countless hours have been spent by developers throughout the years arguing over single vs. double quotes, where to put brackets, how many spaces to type, and all kinds of other cosmetic code style questions. These are all questions that have at best a tangential relationship to code quality, but are very easy to have opinions about because they are so visual. Having a consistent style means that it’s easier to adopt standard tools for error checking. For example, if you adopt a convention that you must always use let or const instead of var, you can now use a tool to ensure all of your variables are scoped the way you expect. That means you can avoid bugs where variables act in unexpected ways. Also, by enforcing that all variables are declared before use, you can catch typos before even running any code! As you write more code and come up against the recommended style rules, you can take that as an opportunity to learn more about your programming language and how different people prefer to use it. The ecmascript package is included in all new apps and packages by default, and compiles all files with the .js file extension automatically. See the list of all ES2015 features supported by the ecmascript package. To get the full experience, you should also use the es5-shim package which is included in all new apps by default. This means you can rely on runtime features like Array#forEach without worrying about which browsers support them. How much does ES2015 cost? “Code linting” is the process of automatically checking your code for common errors or style problems. For example, ESLint can determine if you have made a typo in a variable name, or some part of your code is unreachable because of a poorly written if condition. We recommend using the Airbnb eslint configuration which verifies the Airbnb styleguide. Below, you can find directions for setting up automatic linting at many different stages of development. In general, you want to run the linter as often as possible, because it’s an automated way to identify typos and small errors. Meteor comes with npm bundled so that you can type meteor npm without worrying about installing it yourself. If you like, you can also use a globally installed npm command. "pretest": "npm run lint --silent"
For more details, read the Getting Started directions from the ESLint website. A side note for Emmet users: You can use \ to expand HTML tags in .jsx files, and it will correctly expand classes to React’s “className” property. You can bind to the tab key for this, but you may not want to. Then restart (or reload by pressing Ctrl+Alt+R / Cmd+Opt+R) Atom to activate linting. 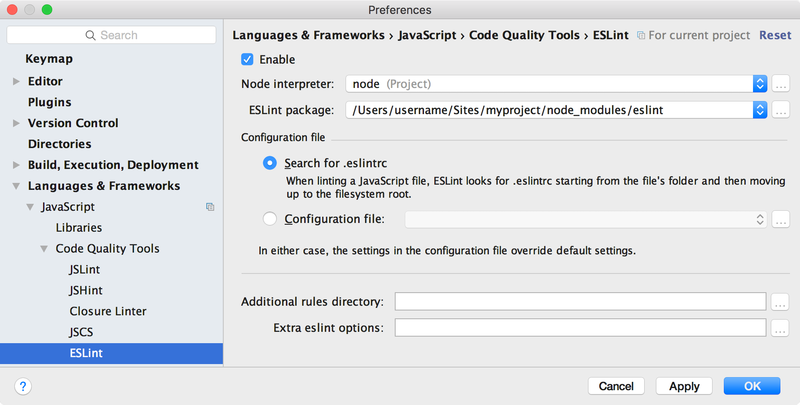 WebStorm provides these instructions for using ESLint. After you install the ESLint Node packages and set up your package.json, enable ESLint and click “Apply”. You can configure how WebStorm should find your .eslintrc file, but on my machine it worked without any changes. It also automatically suggested switching to “JSX Harmony” syntax highlighting. Linting can be activated on WebStorm on a project-by-project basis, or you can set ESLint as a default under Editor > Inspections, choosing the Default profile, checking “ESLint”, and applying. Note that this code sample uses the ValidatedMethod package recommended in the Methods article. If you aren’t using that package, you can use the name as the property passed to Meteor.methods. You should use the ES2015 import and export features to manage your code. This will let you better understand the dependencies between different parts of your code, and it will help you navigate to the source code of a dependency. Each file in your app should represent one logical module. Avoid having catch-all utility modules that export a variety of unrelated functions and symbols. Often, this can mean that it’s good to have one class, UI component, or collection per file, but there are cases where it is OK to make an exception, for example if you have a UI component with a small sub-component that isn’t used outside of that file. Note that imports use relative paths, and include the file extension at the end of the file name. The whole directory or path should indicate that these templates are related to the Lists module, so it’s not necessary to reproduce that information in the file name. Read more about directory structure below.